Our traded timing and poly V pulleys are custom built large pulleys in solid or split construction for higher power transmission. The high power rating makes the drive lighter and compact and reduces static tension and thus improves the bearing life. 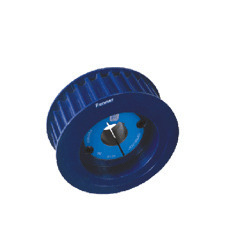 Poly-V pulleys are efficient pulleys which facilitates energy saving up to 6%. These are available in standard ranges of PJ, PK, PL & PM up to 20 ribs.